It is shown that the parents or educators knowledge of the features of the information metabolism of the child will help them to create a space for conscious acceptance for him. Key words: socionics, TIM, upbringing, emotional comfort. The features of the internal quantization of information metabolism functions at 8, 16 and more levels of functioning are considered.A new quantum “stratified” or “crystalloid” model of informational metabolism of psyche extends the socionic borders. Instead of a hard fixed system of 16 types and the correspondent intertype relations it is springing up a possibility of deep modeling of individual human psyche, constructing of a model of concrete FIM structure etc. Both the aspects of social psychology, sociology, psychotherapy and the peculiarities of an individual psychology, even the pathologies, can be described equally. The features of the socionic type logical-sensory extravert (rational) are analyzed in detail. Examples are given, in particular, from the author’s self-observations. Key words: logical-sensory extrovert rational, Administrator, type of information metabolism, Delta quadra, LSE, PS. The author of the work analyzes the socionic type of the famous humanist writer Erich Maria Remarque, from the positions of socionics the specificity of his creativity is described, which has an important humanitarian significance. The author of the work describes the specificity of Remarque's psychological ideas, which can be used by psychological and socionic science. Key words: definition of socionic type, socionic psychobiography, Erich Maria Remarque, humanism, anti-war literature, intuitive-ethical extrovert. The article is devoted to the analysis of the socionic type of the famous artist Salvador Dali based on the materials of his work, autobiographies, biographies, publications of contemporaries and critics, documentaries. The substantiations of the proposed version on dichotomies, socionic motivation and informational aspects are given. Key words: socionics, socionic type, celebrity typing, informational aspects, creativity, art, painting, surrealism. 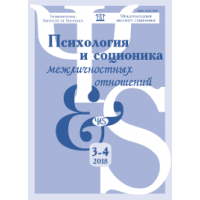 This article is the thirteenth in a series devoted to organization of student studies, where they will learn mathematical apparatus of socionics. This time, the possibility of building and using a system of generators of the intertype relation operators group, which includes the operator of duality, will be considered. 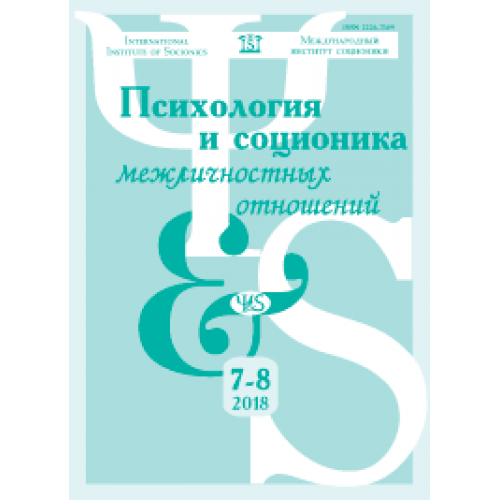 Key words: socionics, classical model of intertype relations, groups of central sections of the socion, cosets by the normal subgroup, factor groups, Augustinavichiute – Reynin traits, Jung – Minaiev traits. A comparison of the personality structure on model A with the structure of the soul is made on the basis of Hebrew tradition. A correspondence between the blocks of information aspects and the levels of the soul, as well as between the quartets of intertype relations and the levels of reality, was found. The prospects of researching the interrelationship of socionic and cabbalistic concepts are shown. Key words: intertype relations, information metabolism, Kabbalah.